Miami Trace senior Hanna Reisinger (right) drives on Chillicothe freshman McKenzie Green during an SCOL game at Miami Trace High School Wednesday, Jan. 25, 2017. The top two teams in the South Central Ohio League met on a rainy Wednesday evening when league-leading Miami Trace hosted second in the league Chillicothe. There was one game separating the two teams in the standings at the beginning of the evening as Miami Trace was perfect in the league at the start. Now there is a tie atop the league standings as the Lady Cavaliers defeated the Lady Panthers, 49-34. Both teams are now 10-1 in the SCOL, each with three league games remaining. Chillicothe is now 15-2 overall, while Miami Trace falls to 14-3 on the season. Simply put, it was a very tough shooting night for Miami Trace, aided, no doubt, by the Chillicothe defense. Miami Trace made just 10 of 52 field goal attempts for a season-low 19 percent. The Lady Panthers were 0 of 20 from behind the three-point line. Miami Trace shot free throws well, making 14 of 19 for 74 percent. Miami Trace had 12 turnovers. The Lady Cavs hit 17 of 38 field goal attempts for 45 percent. Chillicothe made 3 of 10 three-pointers for 30 percent. Their only struggle on this night was at the free throw line where they made 12 of 26 for 46 percent. Junior Tanner Bryant led Miami Trace with 15 points. She also led her team with seven rebounds. Junior Victoria Fliehman had nine points and freshman Shaylee McDonald had seven points. Miami Trace got on the board first with a basket from Fliehman two minutes into the contest. Chillicothe scored the next five points before Bryant scored to make it 5-4 and junior Morgan Miller scored to give the Lady Panthers a 6-5 lead with 3:10 to play in the first period. Unfortunately for Miami Trace, it would be their last lead of the game. Chillicothe closed out the quarter with a 6-0 run to lead, 11-6. Chillicothe continued what would be a 12-0 run with six points to start the second quarter, going in front, 17-6. Bryant and McDonald scored baskets for the Lady Panthers in the second quarter. Chillicothe was in the lead at the break, 21-10. The Lady Cavs began the second half scoring the first five points for a 26-10 lead. Miami Trace dug deep at this point and cut the lead to 10 on a steal and lay-up by Bryant, 28-18. Fliehman scored with 1:35 to play in the third to pull Miami Trace to within eight, 28-20. At the end of the third quarter, Chillicothe was on top, 31-21. 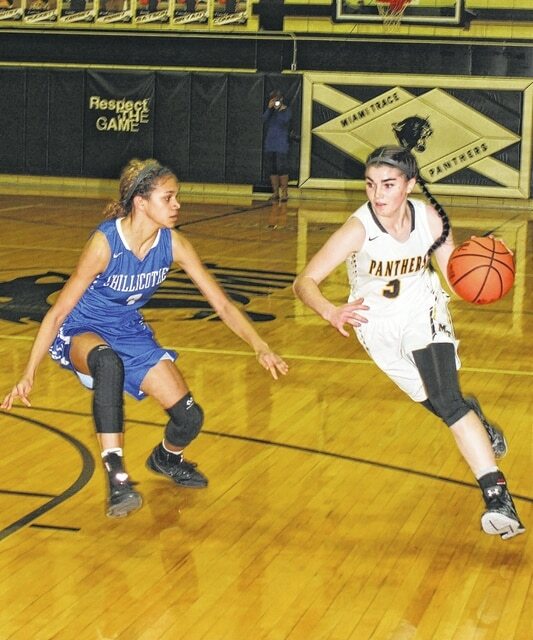 The Lady Panthers were unable to decrease the deficit in the fourth quarter. Chillicothe built a lead of 15 points which turned out to be the final scoring margin, 49-34. “Give Chillicothe all the credit in the world,” Miami Trace head coach Ben Ackley said. “They out-played us tonight for, I would say, at least 29 of the 32 minutes. “I didn’t think our start was terrible, but, at about the five minute mark of the first quarter, we got to the point where we just couldn’t hit a shot,” Ackley said. “We let it affect every aspect of our game. “We talked all week about staying focused,” Chillicothe head coach Pat Beard said. “Understanding the game plan and making sure we executed correctly. “Defensively, we forced them into tough shots,” Beard said. “I thought we did a pretty good job of rebounding. There are always things to learn. Miami Trace’s next game is at Division I Reynoldsburg Saturday at 6 p.m.
MIAMI TRACE — Cassidy Lovett 0-0-0; Becca Ratliff 0-0-0; Hanna Reisinger 0-1-1; Shaylee McDonald 2-3-7; Morgan Miller 1-0-2; Victoria Fliehman 2-5-9; Tanner Bryant 5-5-15; Samantha Ritenour 0-0-0. TOTALS — 10-14-34. Free throw shooting: 14 of 19 for 74 percent. Three-point field goals: none. Combined field goal shooting: 10 of 52 for 19 percent. Three-point field goal shooting: 0 of 20. Rebounds: 24 (7 offensive). Assists: 1. Steals: 7. Personal fouls: 21. Turnovers: 12. CHILLICOTHE — McKenzie Green 0-0-0; Meliah Johnson 0-0-0; Shawnee Smith 2 (2)-0-10; Shawntel Smith 4-9-17; Essence Devlin 1 (1)-1-6; Shawnice Smith 4-1-9; Osh Brown 3-1-7. TOTALS — 14 (3)-12-49. Free throw shooting: 12 of 26 for 46 percent. Three-point field goals: Shawnee Smith, 2; Devlin. Combined field goal shooting: 17 of 38 for 45 percent. Three-point field goal shooting: 3 of 10 for 30 percent. Turnovers: 20. Offensive rebounds: 7.